Listen to me please. 30 men and women are suffering in a Russian jail as you read this. No they are not criminals, they did nothing wrong! Five weeks ago, two of them scaled a Russian oil rig in the Arctic sea to hang a banner protesting oil drilling which can destroy the Arctic wilderness. They, along with other protesters, were stopped under a hail of bullets by Russian coast guards and have been in prison ever since! Yes, their freedom snatched away for trying to stop climate change and defend the Arctic, indigenous people, polar bears and other wildlife. You can help these men and women go home to their families. 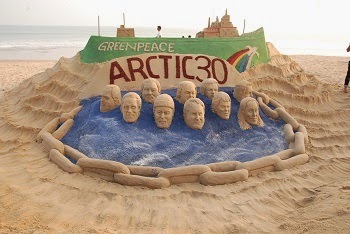 Email the Russian Ambassador in India and demand freedom for the Arctic 30 who have committed no crime! Email the Russian Ambassador Now! The Russian authorities had charged the Arctic 30 with piracy which they changed to hooliganism. The new charge carries a maximum sentence of 7 years while piracy had 15. Over 2 million people like you sent emails to Russian embassies, protested outside and put immense pressure on Russia. It’s time to do this again to force the authorities to drop the new charge as well. Powerful governments are eager to destroy our right to expose environmental crimes and show you what happens in fragile environments like the Arctic. Let’s prove to the Russian government that intimidating activists with prison is not going to stop us from trying to protect the Earth. With your support, it only makes us more determined. Russian military storm Greenpeace Arctic oil protest ship,19th Sept, 2013. Arctic 30: Russia changes piracy charges to hooliganism, 23rd Oct, 2013.